When you are in area where the tuna just aren’t staying on top for long, the captain may elect to troll. Unfortunately this is NOT the most effective method to take big yellowfin tuna. The biggest fish stay tight to the bait balls and are reluctant to leave them for a trolled offering. 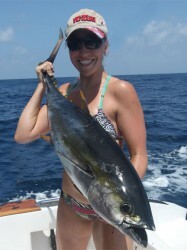 Really big yellowfin simply do not hit the trolling lures as often as the smaller ones do. However, there is still a very good chance that you will get to cast to breaking fish. Choose your target carefully and be patient! Most anglers fail to connect because they simply don’t visualize their cast and pick a productive target. Take your time, and wait for the moment when you are sure you can cast into the fish. Casting from the bow – If the boat has a safe and relatively stable area in the bow, this is the best place to cast from. Even if the captain completely comes of the throttle, the boat will continue to slide forward. For this reason it is critical that you cast at a 45 degree angler or more so that you have a chance to retrieve the lure before the boat runs it over. Casting from the stern – It is critical that you cast at a 45 degree angle FORWARD of the boat. This will give you the longest time in the hit zone. However, you can cast at a 90 degree angle if you have a clear target. If you cast any further back you will soon be dragging the lure behind the boat and the chance\s of getting a strike are minimal. Keep one outrigger up – Have the captain only use an outrigger on one side of the boat. Keep the outrigger up on the side you are most comfortable casting on. It is nearly impossible to make an effective cast with both outriggers in use. Retrieve slack link quickly – Because the boat is moving, you will have a lot of slack line when your lure hits the water. Reel as fast as possible and get the line tight before popping. You are only going to have a handful of pops in the hit zone before the lure is behind the boat. You need to make them count. Troll down wind or cross wind if possible – If there is a choice, be sure to troll down wind or cross wind if possible. A head wind will dramatically cut casting distances. If you have one outrigger up, be sure that it is the outrigger on the downwind side. Be prepared to walk to the stern – If you hook up from the bow, be prepared to walk to the stern where the crew can help gaff and land your fish. If you do not have a way to easily get back, you cannot fish from the bow.